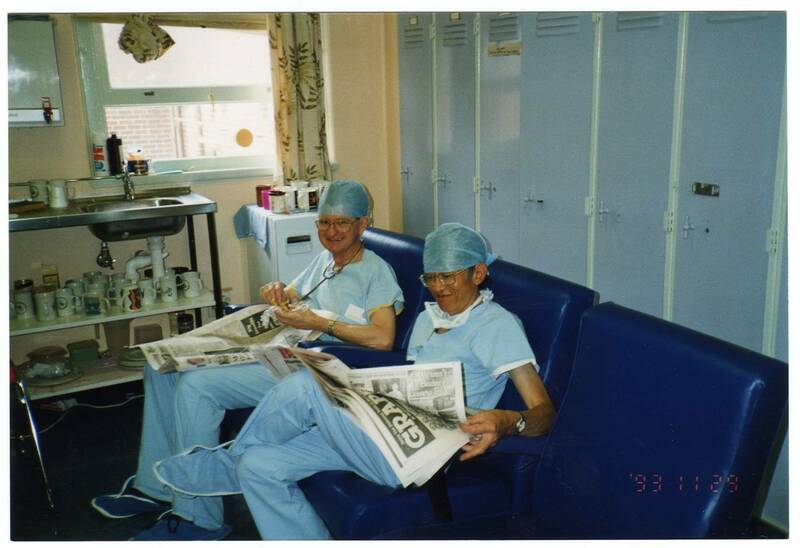 Coffee break for Drs Richard Bailey and Victor Harrison, RAHC 1993. Source: M. Cooper. Research, text and production by Dr Birgit Heilmann, for the Harry Daly Museum, Australian Society of Anaesthetists. Header image: Anaesthetist, RPAH Heritage Centre. Congratulations on a great website which brought back many memories of my time as a student, resident and surgical registrar in Sydney in the 1960’s. I remember Richard Bailey in Cameron Wing with Harry Windsor and Mark Shanahan. I always say that it was an anaesthetist who taught me the importance of speed in closing an abdomen – Bill Jefferis was the Staff Anaesthetist at the Mater North Sydney in 1968 and he leaned over the anaesthetic screen and said to me “This anaesthetic will finish in ten minutes”. I first gave an anaesthetic as a medical student in April 1942, in the Casualty Department of Birmingham General Hospital, UK, which I realise to my astonishment is 72 years ago. Surgical dressers anaesthetised for the incision of abscesses. I was taught by the student who had performed this duty during the previous week. The apparatus, as I later learned, was a fifty year old Hewitt gas and air machine, and his instructions were to give pure nitrous oxide until the ears turned blue, then one breath of air, followed by three of gas to one of air. If the patient started to twitch give an extra breath of air. After three days I became quite good at it, but it was never my intention to become an anaesthetist.